The current plan incorporates buildings of different heights: up to 26 storeys on Bathurst Street, and decreasing heights toward the south, north, and west. They will contain 806 rental residential units (including some affordable housing), over 15,000 square metres of non-residential space, a daycare centre, a four-level underground parking garage, a new market and public park, and streetscaping on Markham St. Of the 27 listed heritage buildings on the site, 24 will be retained and incorporated. 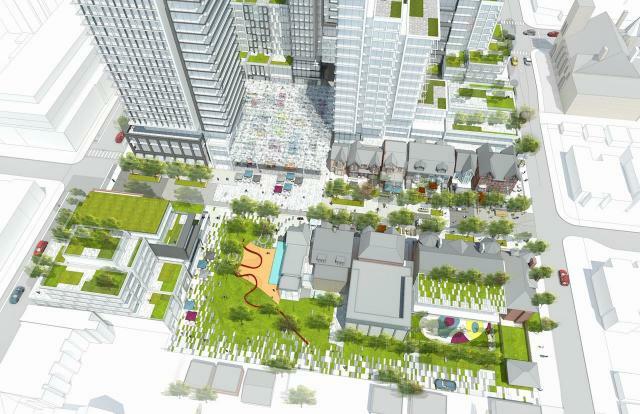 Read more about the lengthy process on the website of the Mirvish Village Task Group. The final report from City Planning is available online. It notes the work still to be done in securing the improvements promised by the developers.